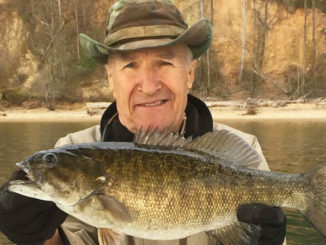 Swim a worm with a big, ripple tail through shallow water and you’ll run into some bass that haven’t locked down on the bed yet. 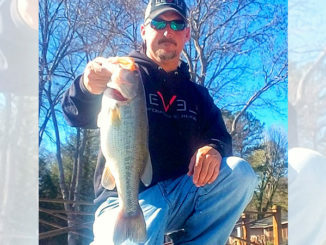 My favorite months to bass fish in the Carolinas are ones when most of the bass are off the banks, when you need good electronics to locate fish and the spots where they live, and when they’ll bite a crankbait. This is a month when you can turn your electronics off and just go fish what you can see. It’s probably our biggest month for sight-fishing. But if you don’t like sight-fishing, or if the water in the lake you fish most often gets stained so you can’t see spawning fish, there are a few things you can do. I like to fish moving baits and find fish that are still staging, that haven’t gone to the bank to spawn. A lot of fishermen get caught up sometimes with all of the fish up on the bank and ignore the others. I will have three baits tied on this month: a Power Worm with a ripple tail, a square-billed crankbait like a Berkley Square Bull, and a jerkbait like a Cutter. These baits have one thing in common: you can fish them slowly, but you can still cover a lot of water. Fishing a swimming worm is something that not everybody thinks about. Sometimes, it takes something a little different, and you can always find a few fish doing this. I like to throw a grape or black worm this time of year, sometimes a finesse worm, but most of the time a big worm with a ripple tail. I crimp on a tiny split shot a few inches up the line from the hook. And I’m going to throw that worm out and wind it back very slowly. The worm has enough action. You don’t need to do anything with it other than reel it directly back in. The square-billed crankbait is another great weapon. You can fish it slowly, and it will deflect off any kind of shallow cover like stumps, rocks or laydowns. I think chartreuse is probably the best color, but they’ll hit gold or sometimes shad colors. 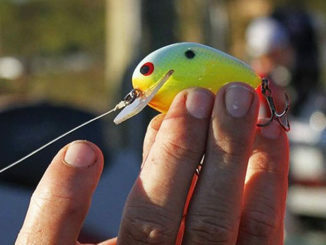 And a good thing about April is that you can actually catch ‘em on a jerkbait fished real slow, something like a Cutter. 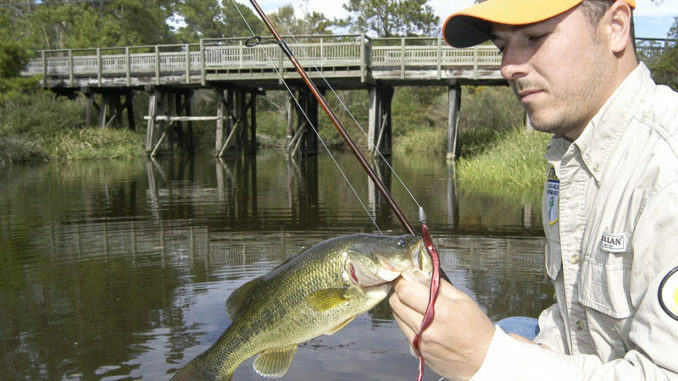 Get the bait down a foot or two and just work it slowly back out of shallow water to the boat. These three baits — a swimming worm, square-bill and jerkbait — they’re three baits that will work if you’re not sight-fishing, and they should work in any kind of water. I like to fish them on a 7-foot, medium-action Lews Custom Pro rod. It’s an awesome rod to fish a jerkbait or a swimming worm. Now, where to fish them. They are going to be shallow. I’m going to be looking from secondary points to the back of pockets. They are probably going to be on flatter stuff, not on drops — flatter points and pockets. A lot comes down to covering water, moving around — keep getting it — trying to find fish that aren’t in yet or on something a little different than fish on the bank. In most of the Carolinas, pockets and creeks on the north side of lakes will have more spawning fish, because they’ve gotten more sun and they’re warmer. The fish in the southside creeks and pockets will go in a little later. That’s where I’m going to start looking. I want to fish for prespawn fish that haven’t moved to the bank yet. 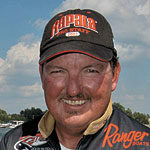 And I like to stick with clear water, so I’m going to do most of my fishing on the mid-lake or lower end of the lakes. I know the upper ends will be a little warmer, and fish will move in up there a little ahead of those in the rest of the lake. One thing that’s good about fishing this way is that on a lot of lakes, especially bigger ones, you can run from area to area where fish are in prespawn, almost like running the tide in a coastal river. You figure out where they are in one creek or pocket and try that kind of area in other, similar creeks or pockets. You just have to find them, find places where not as many have moved up.